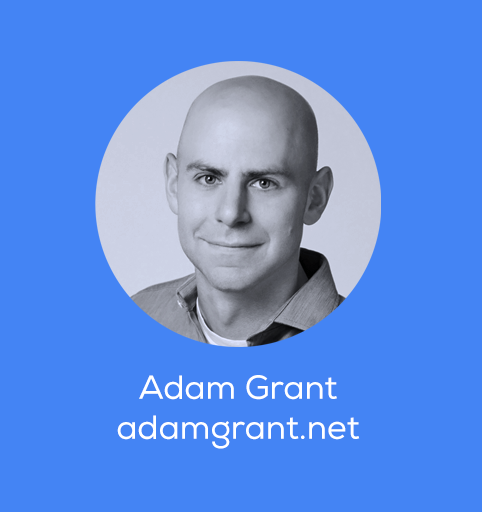 Adam Grant is a leading academic thinker on the topic of email and a professor at the Wharton School. His research focuses on how we can find motivation and meaning to live more generous, creative lives. He is the author of three New York Times-bestselling books, including “Give and Take,” and hosts WorkLife, a TED original podcast. 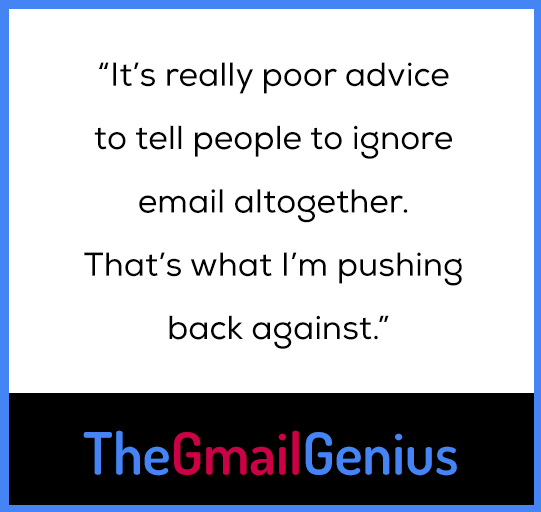 He shares his tactics for being responsive to his busy inbox and discusses the two things he did to make his email life a whole lot less burdensome (hint: it allows him to feel helpful without adding commitments to his calendar). How much time you spend on email each day? Oh, my guess is three hours a day. Does that seem like too much? How do you feel about that kind of time expenditure? It depends on the day. I do a lot of my work over email. When I’m brainstorming ideas, or giving feedback on somebody’s work, or trying to find a particular data point or story, I’ve found that the hour I might spend on 30 emails with 30 people is way more efficient than having two 30-minute meetings. I actually prefer email for a lot of the communication I do. I think I can usually answer questions much faster without getting majorly distracted from my work. I like the fact that it can be done asynchronously. I get to do it on my own time, as opposed to having to schedule a meeting. But are there days when I would like to spend much less time on email? Sure. You wrote an article in The New York Times arguing that we have a professional duty to respond to email. You noted research showing that workers who care about their jobs take email seriously. What else does the research tell us about email habits? As I wrote in the article, it’s a sign of conscientiousness. People who are dependable,disciplined and organized are more responsive [to email]. It sends a clear signal that way. Second, it’s worth thinking about: in what kinds of jobs is this relevant? Most people in the industrialized world today work in a service job. That’s roughly 80 percent of Americans, and over two-thirds of people in Southeast Asia and Western Europe. If you think about what doing service means, it’s fundamentally about responding to other people and trying to meet their needs. Increasingly, a lot of services are provided electronically. Let’s say you’re doing customer service for an airline. It’s amazing how much can be accomplished with a Twitter response or a live chat. This is true for knowledge work as well. If you think about what the knowledge economy is, it’s fundamentally people using their expertise to solve problems. They can do that from anywhere in the world with the communication technologies we have available. Basically, if you work in a service or knowledge job, it’s really hard to imagine being able to do your job effectively and help other people if you’re not responding. There has been lots of buzz about “inbox infinity,” which argues against Inbox Zero and being overly concerned about responding to every email. What was your response to the ideas in the article? Well, I definitely don’t agree with it. I read that article — it was part of why I wrote mine, actually. I was like, wait a minute, this is really bad advice! Yes, of course, if you get 500 or 600 emails a day, responding to those each day would leave room nothing else. And unless that’s your job, that’s not going to work out too well for you. But, if you’re getting that many emails a day, that’s a broken system. I’ve heard this from some journalists who are in that position. That’s a bad submission process. There should not be one person’s inbox that receives all submissions to a newspaper. There should be an online portal. There are all sorts of ways to reduce that load. As an individual, if you’re getting that kind of email, it usually means that you’re pretty visible inside either a huge organization or outside of your organization. I get a lot of cold emails. Between books and TED talks, I have millions of people who are engaged with my content. I get a lot of email, but it’s manageable. I don’t aspire to be at Inbox Zero. I think it’s perfectly fine to have messages waiting, but I also don’t like to leave them piling up. I try to carry 10 to 20 emails unanswered a day. During really busy weeks, I’ll probably come home and have 200 that need a response because I just haven’t been on email. I think never responding is a terrible policy, especially if they’re legitimate emails. I’m not saying anyone should respond to spam or disrespectful or rude messages, and I don’t think any stranger is entitled to your time. I think the middle ground that we should arrive at is: we do our best to respond to reasonable emails on a timeline that’s convenient for us. We need to also think about: which of these are important to my priorities? And, which emails are important to doing my job well? I cited research showing that on days where managers have a heavy email load, they’re less proactive in setting vision, clear goals, expectations and giving feedback. But it’s only true if email is not central to their job. If you manage people who do knowledge work or anything that requires electronic communication, email is a pretty important part of your job. If you have people working with you who are not in your physical office, it’s pretty useful to to ping them quickly. It’s really poor advice to tell people to ignore email altogether. That’s what I’m pushing back against. You outlined the criteria for how you decide whether to respond to an email or not. Do those six approaches hold up? Would you change anything? I don’t know that anything has really changed. One thing I do find surprising is how often people try to convince me that I’m going to get something out of helping them. I think they’re kind of missing the point. Generally speaking, if you’re a stranger asking me for my time, the goal is not to convince me that it’s going to benefit me. That’s not why I respond to strangers. That’s not why I generally respond to email. Most of the time, I respond because I think the request is meaningful to the person who is asking, or they’re trying to help someone else. Or if I think what they’re doing matters. I also respond if there’s an easy way to suggest something that might be useful. The mistake people make is they’re too short-sighted and transactional — assuming the only way to motivate me is to appeal to my self interest. Anybody who’s engaged with my work would know better, right? One of the reasons I studied givers and takers is that I really enjoy being helpful when it’s not a huge sacrifice. So I would add maybe a seventh point [to the article]: don’t try to convince somebody that by doing a favor, it will be good for them. Instead, try to help them see how they can make a difference in a way that’s beneficial to you and not costly to them. Now that I think of it, I’m surprised by the number of people who insist on meeting on their terms instead of yours — when they’re the one asking. The worst thing you can do is email me out of the blue and ask to meet with you face-to-face next week or tomorrow or whatever. You’re asking me for my time. Why don’t you ask me what the most efficient way to connect is — when it might be convenient for me? If you’re the one reaching out, let the person who is going to help you decide what the times are and when. What has personally helped you the most with how you manage email? What has been most impactful? Honestly, I think the things that have helped me the most are FAQ and triage. There are common questions that come in [via email] and it didn’t occur to me for a while — until I got so many similar questions in the same week — to create a single document for this. I put together answers to the most common questions I get and send it to anybody who asks about those topics. A bunch of those actually turned into articles that I published. The other thing is having a team and network of collaborators who are available and knowledgeable on different kinds of requests. I’ll give you an example. I get anywhere from 50 to 100 speaking inquiries a week. There’s no way I’m going to end up taking even a fraction of those. It’s immensely helpful to know people in my orbit who speak on similar topics, have overlapping expertise, and are interested in doing more speaking. Because I can start referring talks to them. That feels like a win-win, because it helps the person who I’m not going to be able to show up for. Hopefully, it also helps the person who gives the talk. I have a bunch of people for different kinds of requests that I know I can’t field individually.